Anthony Dion, a 2007 graduate of the University of Washington's school of journalism, has six years of reporting and editing experience. He also works for CBS Radio's 1090 AM The Fan, Seattle's newest sports talk show, where he reports on UW football and basketball as well as Seattle Thunderbirds hockey. After lifting the weight of a seven-game losing streak, the Huskies fell back to earth Wednesday night with an 88-66 drubbing courtesy of UCLA at Pauley Pavilion. Andrew Andrews and the rest of his teammates were unable to carry over the momentum of Sunday's game-winning shot against against Washington State. Super Bowl Sunday meant a small crowd as the Huskies went back to work for the second time without big man Robert Upshaw against Cal. The sparse Alaska Airlines Arena crowd tinged in Seahawks blue watched as Cal's Sam Singer hit game-winning three-pointer with four seconds to play, sending Washington to a 90-88 defeat. A little over 48 hours after dismissing seven-foot center Robert Upshaw from the program, the Huskies fell 84-74 to Stanford at Alaska Airlines Arena in a game that never felt as close as the final score. Afterward, Washington's focus was on incremental improvement. Lorenzo Romar's hope was the size and athleticism of his roster would make for a tough-to-solve 2-3 zone defense. In its first real test, Washington's zone was no match for Utah in a 77-56 loss Sunday at the John M. Huntsman Center in Salt Lake City. In a game with seven ties and 10 lead changes, Andrew Andrews coolly nailed a jumper from the top of the key with one second remaining to give the Washington Huskies a 52-50 win over Colorado at the Coors Event Center in Boulder Thursday. When Nigel Williams-Goss connected on a 3-pointer to open the second half, the Huskies let Oregon know the first 20 minutes were in the rear-view mirror. The shot cut a 42-32 halftime lead to seven and immediately put the Ducks on their heels. It keyed a 53-point second half for an 85-77 Huskies victory at Alaska Airlines Arena Sunday. It didn't end gracefully, but it ended nonetheless. The Washington Huskies halted a head-scratching four-game losing skid with a 56-43 win over Oregon State Thursday in front of 6,663 at Alaska Airlines Arena. The Huskies remain undefeated, but not without drama Monday night at Hec Ed against an underdog, thanks to a season-high 18 turnovers. But Washington (11-0) overcome a sloppy first half to defeat Tulane 66-57. UW equaled its best start under coach Lorenzo Romar, previously done in the 2005-06 season, in its penultimate nonconference game. The difference in talent was apparent from the opening tip. Grambling State of the Southwestern Conference had no answer for the superior size and length of the Huskies' front court. The result was an 86-38 walkover win for the 16th-ranked Huskies Wednesday at Alaska Airlines Arena. If Sunday's contest was any indication, the University of Washington basketball team still has a ways to go to become the legitimate March Madness contender it aspires to be. That said, a tireless 81-77 come-from-behind victory over Eastern Washington (8-2) at Alaska Airlines Arena showed some heart and should pay dividends during an exhausting Pac-12 conference slate. The Washington Huskies (8-5, 4-5) accepted Sunday an invitation to play in the Cactus Bowl Jan. 2, the first under coach Chris Petersen and fifth in a row, against Oklahoma State (6-6, 4-5) of the Big 12 Conference. "We're really excited to go down (to Tempe, AZ. )," Petersen said. "I think Oklahoma State has a terrific program . . . It will be a really nice match-up and a competitive game." As the Mariners sit out the postseason for the 34th time in their 38-year existence, speculation about off-season plans are underway. General manager Jack Zduriencik said Tuesday the payroll is going up, and his priorities are a starting pitcher and at least one proven mid-lineup hitter. The standing ovation Felix Hernandez received Sunday came in a manner other than for what he hoped. In as close to a playoff game as Hernandez has experienced, the 28-year-old rose to the occasion. Game No. 161 had meaning. A crowd of 32,716 playoff-starved Mariners faithful gave it feeling. To top all, a loss in Texas by the Athletics loss about two hours in gave it substance. All that was missing Saturday night at Safeco was a walk-off conclusion. 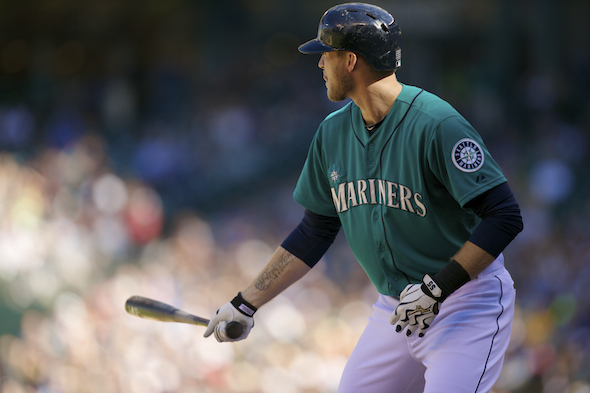 In search of a much-needed victory Wednesday, the Mariners offered up another dud. Enduring their fifth consecutive loss and 12th in the past 17 games, Seattle squandered a brilliant effort from rookie starter Taijuan Walker and fell 1-0 to Mark Buehrle and the Blue Jays in Toronto. Not even the great Felix Hernandez was immune to the late-season implosion of the Mariners pitching staff. Five days removed from dominating the Angels, Hernandez Tuesday in Toronto took on a mightier foe in the Blue Jays, second in the American League in home runs and OPS. He was crushed. After 15 dominant starts to begin his career, James Paxton endured his first clunker of the season at the worst possible time, continuing the Mariners September swoon Monday in a 14-4 loss to the Blue Jays in Toronto, the first of the final four road games of the season. 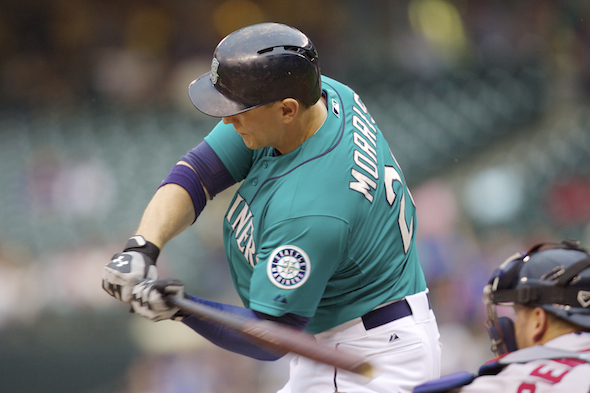 With one swing of his bat Thursday night, Logan Morrison electrified the city of Seattle from Anaheim. With two outs and two runners on in the ninth inning of a scoreless game, Morrison sent a 1-1 pitch over the high wall in right-center field of Angel Stadium. A seventh-inning defensive miscue was all it took to see one of the best-pitched games from a Mariners starter this season turned into dust. All it took for the Mariners to squander another game it needed. All it took for the Angels to break open a scoreless game for a 5-0 win Wednesday night in Anaheim. This was one hit the the Mariners needed: Oh-for-the-past 17 and trailing 2-0 in the fifth inning, Mike Zunino smashed a double over the head of centerfielder Mike Trout to tie the game and break the dam for a 13-2 romp in Anaheim Tuesday night that ended a three-game losing streak.